The Arena is located in the east district of the Imperial City, where people of Cyrodiil attend to watch brave warriors fight to the death for fame and gold. This faction was established by the first Blademaster, Gaiden Shinji, of the Order of Diagna. It was to be a place where warriors could prove their worth. Though he died shortly after its completion, the Arena owes its existence to him. To join the gladiatorial ranks of the Arena, speak to Owyn, the Blademaster in the Bloodworks. You will automatically become a member of the Blue Team, and he gives you the choice of a Heavy or Light Raiment. For each match won, the participant is paid according to their rank within the Arena, a range of 50 gold to 500 gold. This gold is level-independent, with virtually no affiliations with other quests, making it a good starting questline for low-level characters. After each fight, the Arena combatants can use the Basin of Renewal found inside the "Red Room" (so named because blood from the arena floor above is said to drip down the walls) to restore themselves. When you become the Blue Team Champion, you will receive a title of your choice, one that will stretch across all of Cyrodiil. After you defeat The Gray Prince and become the Grand Champion, you will be approached by an Adoring Fan who will want to be your "side kick", offering to carry your weapon or give you a back rub and other things of the sort (none of which is doable). See his page for the potential benefits and detriments he offers. Once you achieve the prestigious title of Grand Champion, you will also get a Raiment of Valor. Be sure to take Agronak's Raiment from the Gray Prince when you beat him. Once you give it to Ysabel Andronicus, she will give you your own in return - Heavy or Light. Alternatively, if you decide not to hand over the armor, you can keep Agronak's Raiment, which (unlike your own raiment) is a quest item and therefore effectively has no weight. However, this is advised against, as the armor you receive from Ysabel will have the same enchantments, and you will be unable to receive the benefits of being the Grand Champion. Afterwards, when you manage to make it to the Grand Champion matches, you can start looting creatures. This is quite beneficial once you start fighting Minotaurs, who carry Blunt weapons and naturally hold their Minotaur Horns, which are useful in Alchemy. The maximum reward you can get for each creature is 40+(player level-1)×50 gold. The actual amount is somewhat random as it is taken from a leveled list, thus at level 30 you can get anywhere between 40 and 1,490 gold although higher values are more likely. The gold is calculated for each creature you fight, so the maximum reward that can ever be obtained is 4,470 gold. Beyond the gold, you will gain 31 fame points for completing the entire Arena quest. You get 10 fame points for defeating The Gray Prince alone. You must wear your Heavy or Light Raiment issued to you by Owyn. This rule does not apply to the Grand Champion match. In the two cabinets there are replacement suits of armor (5 light and 5 heavy in each), so you don't have to worry about repair. You may wear any helms, shields, or jewelry. You cannot scavenge the corpses of your foes. This rule does not apply to the Grand Champion match. This prohibition extends to weapons and shields that are knocked out of an opponent's hands. The sole exception to the rule are arrows which have missed: they can be recovered during or after a match. Trying to scavenge from a corpse will not result in a penalty but a message will appear telling you that this act is not permitted. You can only fight from 9am to 9pm. This is the time you request a fight. You may wait until any time to actually begin your fight. The Grand Champion is not bound by the time. You can't bet and fight at the same time. Speak with Hundolin to resolve any unfinished bets. The rules of the arena are "anything goes". You can use any weapon or cast any spell in your matches, and may freely use potions, poisons, scrolls, or sneak attacks. If you remove your armor during your match, the fight will end and you will be disqualified for it (prompting a scolding from Owyn). This effectively enables you to skip a match for whatever reason. However, if you do it a second time, your career as an Arena combatant will come to an abrupt and ignominious end. There is no way to get back into the Arena after being expelled. If you strike an opponent after being disqualified, your attack will not hurt them unless it delivers enough damage to kill. You will get the message: "You are disqualified, and must return to Owyn in the Bloodworks! Do not disgrace yourself any further...."
Survive, and you can pass on your tips. After every fight, make sure you use the basin, since it restores all of your Health, Magicka, and Fatigue. You can only use it after a fight. You wash the grime of battle from your body, and feel completely rejuvenated. You have not yet bloodied yourself in the Arena. Return and refresh yourself after tasting battle. After the fourth match, Owyn will give you tips before each match from now on. Pay attention to the advice he gives you. The details he reveals can give you a heads-up on your next opponent. The four pillars in the arena make a small yet effective way to guard from arrows, just make sure you know where the enemy is at all times. You can then hide behind the pillar to heal or jump out and cast a spell. The script that prevents you from picking up arena weapons in matches has a bug that affects the enemy combatants as well, so if you are a Journeyman or higher in your combat skill you can simply disarm an opponent. They'll be forced to fight Hand to Hand with the corresponding loss of damage, perks, etc. A good way to avoid taking damage is to run backward in a circle around the arena pit. This is especially useful if you use ranged spells or a bow. The attacker(s) will follow you, allowing you to stay out of their reach for the most part, and chip away at their health and also cast healing spells on yourself. Your enemies and their equipment are leveled. A detailed description of the gear used by Arena opponents can be found at the Arena Combatants page. ^bAgronak gro-Malog is fixed at Level 10 and will not level up with you (though his weapon and shield will). Because of this, you will find him to be a fairly easy opponent if you are above (or even at) Level 10. If you have reached the higher levels of the game you will find him to be no challenge at all. If you complete the quest Origin of the Gray Prince and inform Agronak of his "bloodline", he will become nearly suicidal and simply stand still during the match, allowing you to attack him with no retaliation. This is considered murder and is one way to enter the Dark Brotherhood. If you dislike the idea of hacking away at the Gray Prince while he's standing motionless and begging for his death, wait until after he talks to you, then cast a powerful Frenzy spell on him. As soon as you attack him, he will fight back. His war-cries will alternate between "Strike me again!" and "I've fought mudcrabs more fearsome than you!" Once you challenge Agronak for the title of Grand Champion, Ysabel will tell you that you need an Arena name; something that, as she puts it, "the people of Cyrodiil will remember when they tell stories about your inglorious defeat!" She gives you twelve options; two specific to your character's gender and ten general names. Once you kill The Gray Prince, go talk to Ysabel Andronicus. After a well deserved congratulations, she will talk about arranging weekly fights against varying creatures. You may choose between three different options of creatures to fight, once per week. As Grand Champion, you can fight with whatever weapons/armor you like and whenever you like; it is also completely optional. The maximum reward you can get for each creature is 40+(player level-1)×50 gold. The actual amount is somewhat random as it is taken from a leveled list, thus at level 30 you can get anywhere between 40 and 1,490 gold although higher values are more likely. The gold is calculated for each creature you fight, so the maximum reward that can ever be obtained is 4,470 gold. If the amount of gold you are paid per Grand Champion matches starts to decrease, try waiting in-game for two weeks instead of one between fights. This will up the amount of gold you will receive for your next fight, possibly even up to the 4,470 gp max. Details on the creatures that may be fought can be found here. ^cAlthough Agronak gro-Malog is labeled as the Grand Champion, he is not in the faction within the construction set. Killing your arena opponents can potentially count as murder. This happens if the opponent is killed without him/her ever turning hostile; for example, you immediately cast a Demoralize spell. Although you will not gain a bounty for the murder, it will appear in your statistics and will initiate the Dark Brotherhood questline. When you become the Grand Champion of the Arena, Owyn tells you, "You beat them, every last one!" However, you can immediately go talk to Hundolin, bet on a match, and watch a Yellow Team fighter brawl. There are a couple of free weapons around the Bloodworks. It will not be stealing if you take them once you're a combatant, but they are not particularly good or valuable as for the most part they are made of iron, the weakest kind of weapon. The chest next to Hundolin in the Arena entrance contains 500 gold and makes a good source of cash for enterprising thieves. 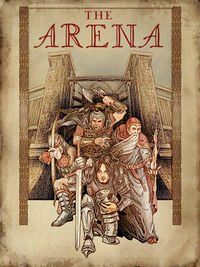 In random dialogue, some NPCs will claim that the Arena fights are faked: "You think those guys are getting killed? Really? It's just berry syrup and ham-acting." After you defeat the Gray Prince, the commentator incorrectly states, "See the Blademaster to collect your winnings..." when in fact you have to see the Battle Matron. There is another arena rank image available in the Construction Set called "Challenger". It is probably a removed rank, as it is not possible to achieve this rank. Your difficulty settings do not affect the amount of gold you earn from each Grand Champion fight. In other words, you earn the same amount of gold regardless of whether or not your difficulty is set to easy or hard. To obtain a Yellow Team Raiment follow these instructions. Bet on the yellow team and enter the arena spectator area; you will be in the yellow team box. If the combatant from yellow wins and is facing you, kill someone. An Imperial Legion soldier will come. Kill him while the combatant is facing you, they will run towards the wall under you (this may take a few tries to work). Run outside, and in about ten seconds, the combatant will appear outside. You can then kill them and obtain the yellow team's raiment. This technique also works with the blue team, but there is little need for this, as you can just join the arena and automatically get a Blue Team raiment. Wearing the yellow raiment will not allow you to compete in arena matches; the script for allowing that to happen is only implemented on the blue raiment. An alternative is to use the floating paint brush glitch to climb over the invisible barrier around the arena pit. Once inside, simply grab the raiment from a dead yellow team gladiator and climb back out using your paint brush bridge. If you have not yet finished the arena quest line, you can also obtain a Yellow Team heavy raiment by pickpocketing it from the yellow team champion while she sleeps in the Bloodworks. An achievement will be unlocked each time you advance in rank. Completing the Origin of the Gray Prince side quest may make it impossible to become Grand Champion. This can be resolved through use of the console. Go into the arena to fight gro-Malog, do not attack him, let him run up to you and beg you to kill him. Then kill him. Take his Raiment of Valor and then use the console command SetStage MS52 100 followed by SetStage ArenaDialogue 50. Next, go downstairs and speak with Ysabel and you should be able to complete the quest. It is possible to fix this by talking to Agronak gro-Malog in the arena and then killing him, but not looting his body. Wait for the announcer to stop speaking and tell you to take gro-Malog's Raiment of Valor then go to see Ysabel Andronicus. She will say to you that you have defeated him and then go get his raiment and give it to her. Now all you have to do is choose heavy or light armor. This bug can be avoided by immediately approaching Agronak once the arena gates are lowered. Speak with him first and he will beg you to kill him. Then you may oblige the poor half-Orc, he will even egg you on. Once he is dead, loot the body and return to Ysabel with his raiment for your reward, status of Grand Champion, and completion of the quest. This may be related to another reported bug in which the game will not allow you to leave the Arena after killing gro-Malog—again, the Gray Prince side quest seems to be at the root of everything. To get out of this problem you should be able to run the same console codes as stated earlier and continue. It is possible to fall through the wall in the arena, which prevents your opponent from being able to damage you, but still allows you to attack him. From the opening of the entry tunnel (e.g., where the gate drops at the beginning of a match), look back down the tunnel. On your left, between the rim of the tunnel and the wall, you should see a slight bank in the wall. First jump backwards into the wall so you are standing on the slant, facing the gate. Repeatedly jump forcing yourself back against the wall and as you do this turn to face the slant making sure you stay on top of it. You will now fall through the wall. As you fall through the wall you should notice a ledge that sticks out of the normal game boundaries right where the stairs up the tunnel start. Try to land on this ledge. Don't worry if you miss the first couple of tries, you will simply spawn back in the arena with no damage. Once you are on the ledge your opponent will walk down the tunnel and try to hit you but won't be able to through the wall and will repeatedly run into it. You on the other hand will be able to hit your opponent through the wall using either your sword, magic or arrows. Once you have disposed of the enemy simply drop off the edge and spawn back in the arena. 20 Woot! I got the fletcher! 30 Stealth trainer for me! 40 Where my supplier at? Oh yeah, in my cave. 50 Security trainer and his box of locks are active! If you kill gro-Malog without ever actually talking to him, his corpse will ask you to kill him when you attempt to loot his body. This is because the match script will resurrect gro-Malog (only once) if you kill him before speaking to him, but the game registers him as dead. You will notice that even though it looks like you're going to loot a corpse, it still shows a life-gauge with a sliver of life. You can attack him again at that point and he will permanently die. Do not hit gro-Malog with any spell like Flare when he is in limbo on the ground. It may be impossible to kill him with it, and even though he will proceed to stand upright, he will become a ghost - you cannot interact with him at all anymore. ? If you have an active conjuration effect that provides boots, greaves, cuirass, or gauntlets (such as from a spell or a Hestra Rune Stone) attempting to equip the arena raiment will fail, but the game registers it as being worn. This means you can equip any other armor and go into the arena to fight. You will not be disqualified for not wearing the raiment. If you get disqualified in your first match, you will restart the match, only when you kill the Pit Dog and go to Owyn for your reward, he will merely yell at you, telling you that you have a match up at the arena, even though you already won it. This bug is fixed by the Official Oblivion Patch. When Owyn asks you which armor you want, if you take the opposite piece of armor from the cabinet next to him, you may not be able wear the armor you originally wanted. ? You can get disqualified for not wearing Arena Raiment, when wearing Heavy Arena Raiment, if you also have light raiment equipped. 10 If I wish to join the Arena faction as a combatant, I must speak with Owyn the Blademaster in the Arena Bloodworks. 20 I am now a combatant in the Arena faction. To arrange for a match, I must speak with Owyn in the Arena Bloodworks, in the Imperial City. After every match, I must speak to Owyn again to close out the match and receive any rewards earned. While I'm involved in any active matches, I will be unable to bet on any fights. 40 I am now an Arena Champion. There are no more standard matches left to fight. Instead, I must challenge the Grand Champion, Agronak gro-Malog, for his title. 50 I have defeated the Gray Prince and have been named the new Arena Grand Champion! Ysabel Andronicus told me to return to her after I've gotten some rest, so we can discuss my future. 100 As Arena Grand Champion, I can fight in weekly matches against various creatures. All I need do is see Ysabel Andronicus in the Arena Bloodworks and tell her I'm ready for a match. It is possible to use the console to advance through the quest by entering setstage quest stage, where quest is the internal name of the quest, and stage is the number of the stage you wish to complete. It is not possible to un-complete (i.e. go back) quest stages. See SetStage for more information. You can remove the last journal entry by using the following console command: completequest arenadialogue. Doing this will not prevent you from participating in Arena matches. This page was last modified on 12 January 2019, at 23:37.